Firecracker, Firecracker, Boom, Boom, Boom! So goes a cheer from my junior high school days. I have no idea why I would remember such a thing–it’s probably one of those patterns of speech that the brain is so attracted to. I do however know why I like the Uruguayan Firecracker Plant (Dicliptera suberecta). It’s a tough and beautiful summer bloomer which, though not native to North America, is a great plant for the home gardener. It works well here in Zone 8B as a herbaceous perennial but can also be found further north, though it may not be winter hardy. I planted mine last July. Yes, last July. When the average temperature was about a 1000 degrees. I bought a gallon pot and gave it a little water everyday for a few weeks, then backed off to giving it water several times per week. By autumn, the plant had grown and the leaves weren’t curling up in pain from the extreme temperatures. It didn’t die back this past winter and has continued its moderate growth pattern. My plant started blooming in May. The leaves are green-grey and ovate. They are also soft and fuzzy, which tends to be a characteristic of very xeric plants. And the Uruguayan Firecracker Plant does seem to be xeric. I haven’t watered but once this summer and it’s performing well. The plant only gets about two feet tall and spreads like a ground cover, so it’s something that should be planted at the front of a garden. 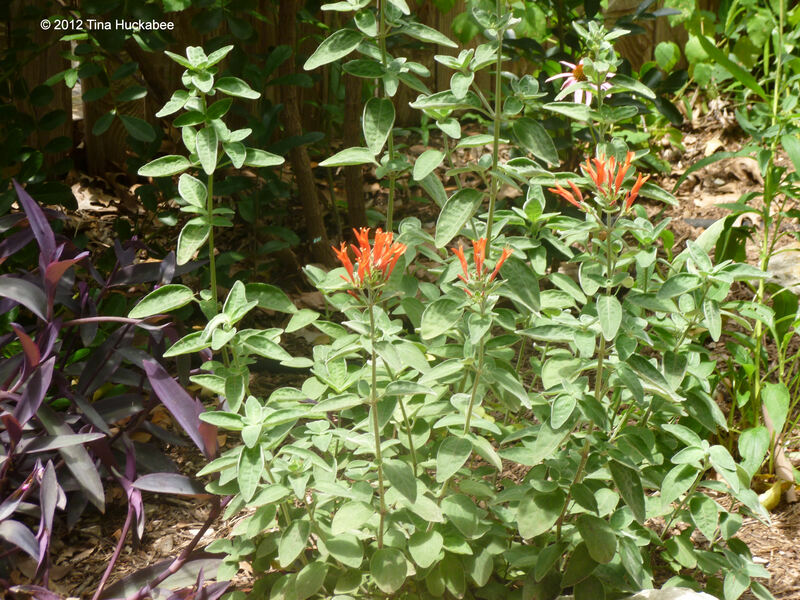 Uruguayan Firecracker Plant blooms best in sun, but I chose if for its shade tolerant qualities. 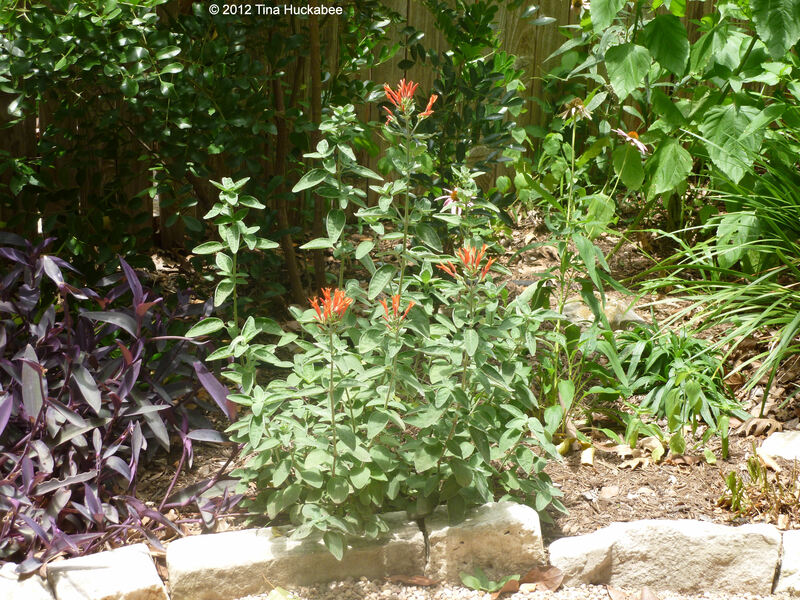 Here in sunny, hot Texas, it’s a good plant for a dappled shade/part shade situation. The leaves will curl somewhat unattractively in full sun, but in a shadier spot, the foliage is quite lush. 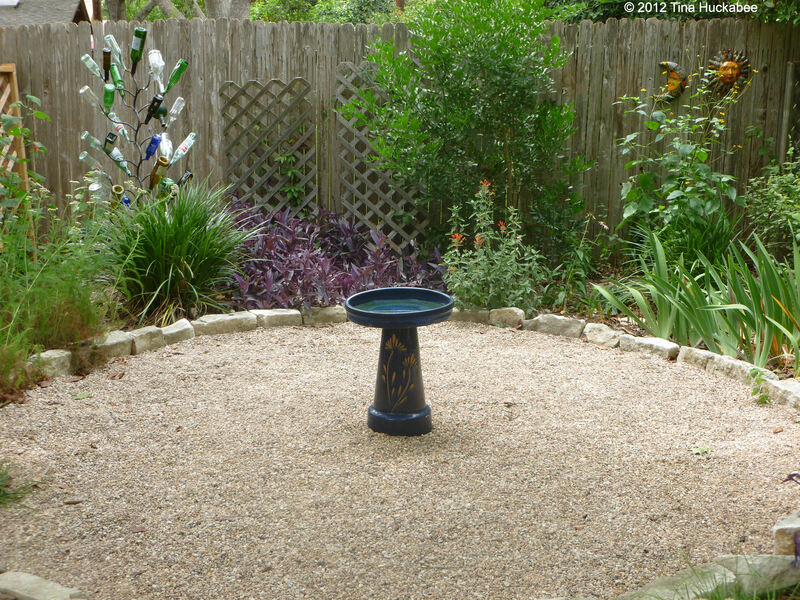 I was in fact researching this plant to use in the Green Garden at Zilker Botanical Garden when I realized that I had the perfect spot for it at home. This area gets about two hours of direct summer sun (late morning to early afternoon) and is in shade or dappled light for the rest of the time. I like it here, where it fronts this small Texas Mountain Laurel (Sophora secundiflora) and as a companion to the Purple Heart(Tradescantia pallida). I’m happy with this new addition to my garden. It’s rewarding to find a plant that is easy and pretty, especially in a shade/part shade situation. It has showy blooms and lovely foliage. There don’t seem to be any insect or disease issues and according to Pacific Horticulture and Barton Springs Nursery, this plant is deer resistant. It doesn’t get much better than that. And that’s definitely something to cheer about! 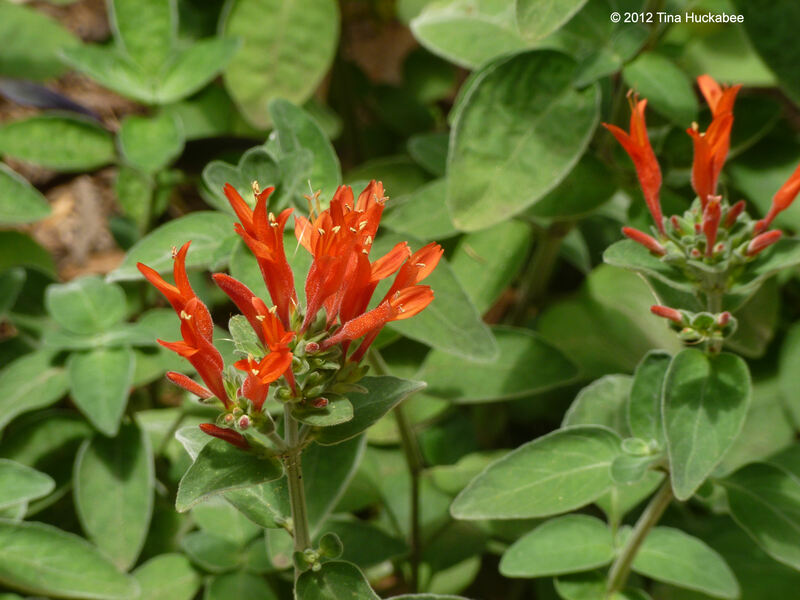 This entry was posted in Dicliptera erecta, Uruguayan Firecracker Plant, Wildlife food, Xeric plants by Tina. Bookmark the permalink. I think I know that cheer. Isn’t it funny how those verses just stick in the brain. That’s a great looking plant. 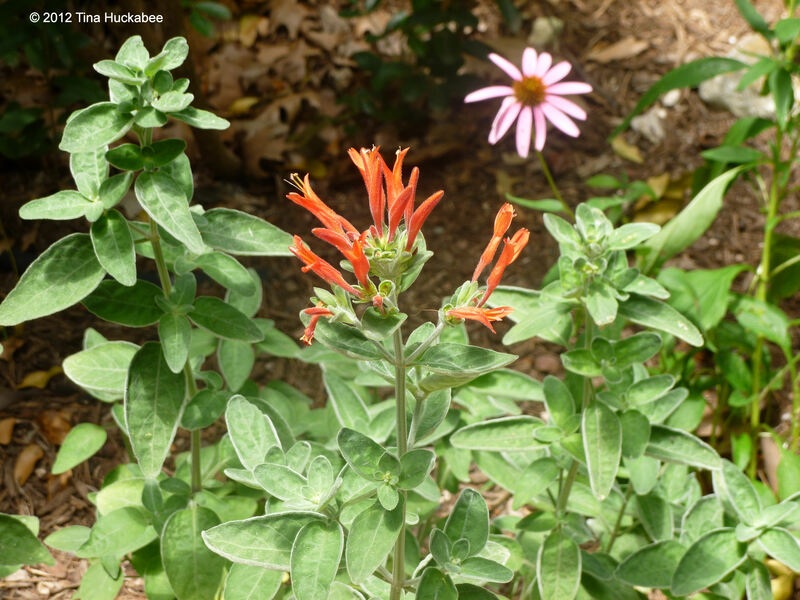 Fuzzy leaves, grayish, green foliage and bright orange flowers, what more could you want? Ally, it was the weirdest thing: I was writing the post and thought,”Man, what’s my title?” And the cheer popped into my head. I wasn’t even a cheerleader and I can’t have given that cheer a thought since junior high. But the plant is a good one and I’m happy to have it included in my garden. That is quite a pop of orange color. I love it in juxtaposition with the purple heart (which we call Moses in a boat). That is going on the “buy some” list for sure! I can already think of several spots it would be happy to fill. Thanks for the pointer, Tina. It’s a nice plant that I might have overlooked except for the knowledgeable plant person at Barton Springs Nursery. 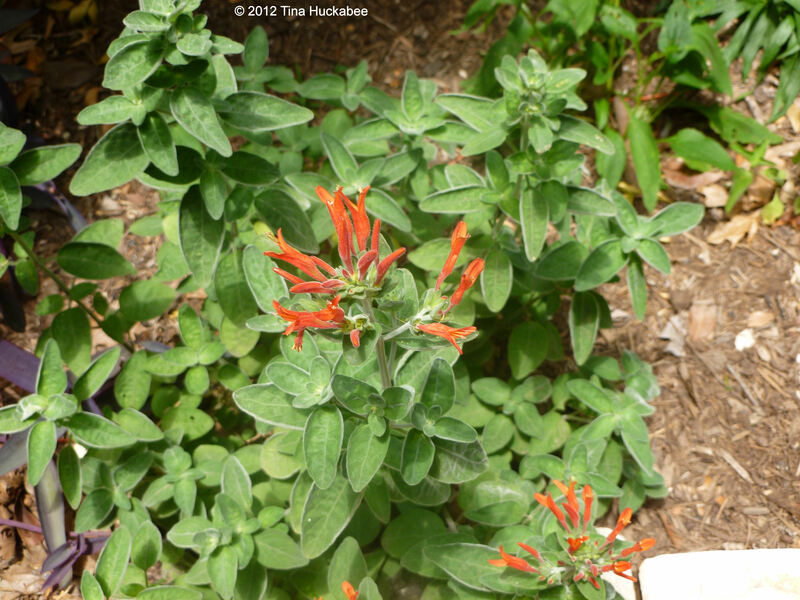 Tina, I forgot to ask – do you think this might work as a companion plant to Mexican honeysuckle (justicia something or other)? Those bloom so early and this seems to have later/longer lasting similarly colored blossoms and I’m thinking in combination I might get nearly year ’round orange in a particular corner that gets a fair blast of afternoon sun all summer. I think that’s a great idea. 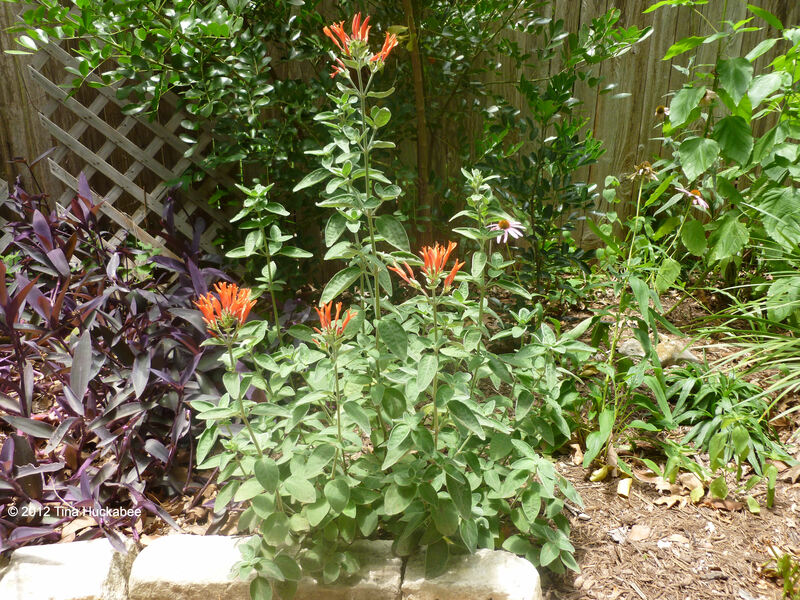 My Mexican Honeysuckle is in a similar light situation and you’re correct–it tends to bloom in the fall, winter (if mild) and spring. The Firecracker is at its best in the hot summer months. I do think morning sun would be best for both (isn’t it best for all of us? ), but if it’s not too long of a blast of afternoon sun, both would work there. My Dicliptera suberecta eventually declined and I pulled it last year. It didn’t take well to the occasional hard freezes we have here in the Central Texas area. Additionally, while the foliage and rare blooms were a treat, I found that it required more water than I typically am willing to give.